We’re at the cusp of seeing a lot of new peer to peer (P2P) marketplaces with decentralized operations. Recent advances in blockchain technology based on decentralized consensus are making it possible to create totally decentralized marketplaces whose usage will be easily met by the critical mass of Internet users. 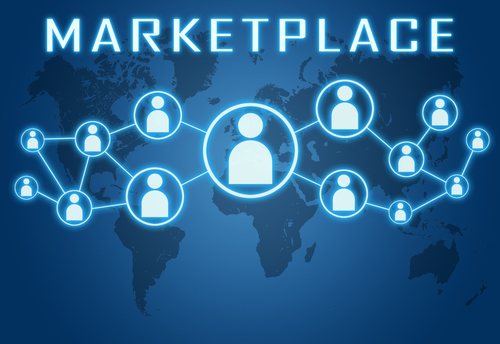 Existing P2P marketplaces have some characteristics of traditional marketplaces, but there is more to it. Among the existing factors for marketplaces success, liquidity is important. Onboarding difficulty is also a factor. Other barriers could be psychological, legal, technological, or business model related. We need to preserve these characteristics, but go beyond them. A decentralized P2P marketplace has a lot less friction at the center than traditional marketplaces. There is a lot more power and benefits at the edges than there are at the center. In a previous blog post, The Race to Decentralize Everything and Give Power to the Edge of the Networks, I mentioned that marketplaces are one of the areas being affected. 1) Vertical marketplaces: Top-down controls. That’s where most e-commerce sites are. They sell, you buy. Examples: Bonobos, Birchbox, Frank & Oak, etc. 2) Semi-central marketplaces: They facilitate selling and buying laterally, and outside of a top-down model. Amazon, eBay, Etsy are the grand daddies. A few sell, many buy. 3) Decentralized peer-to-peer marketplaces: Anyone sells. Everyone buys. As many sellers as buyers. The central controls less. Trust, rules, identity, payments are embedded at the peer level. Participants arrive already trusted, and decentrally acknowledged. Examples of marketplaces and services to support them are being concocted by startups, such as Lazooz for transportation, OpenBazaar for p2p trading, or Openname as the identity protocol. I’m particularly excited that we are going to see increased innovation around the creation of decentralized peer-to-peer marketplaces. I think the required plumbing infrastructure & middleware services to enable their operations are becoming more and more available. What do these P2P marketplaces typically do? 1) Sharing. This includes temporary renting, using or leasing from someone else on the network. E.g Sidecar. 2) Selling and buying. Peers selling and buying from each other. Eg VarageSale, Kiinzel. 3) Providing a service. Each peer can provide a service, or find a service. E.g. Vayable. What are the requirements for participation into these marketplaces? Maybe one day, launching a decentralized peer-to-peer marketplace will be as easy as running a website.